The Climbing meta Tracker has been designed as a web app, which means you currently need access to the internet to use it. It is fully responsive and will work nicely on a mobile device (best in landscape mode), so we suggest setting up a shortcut icon on your phone and saving your login details to make this nice and simple. We have some big plans for the tracker and hope to bring you a fully native phone app in the future, but we need your support to make it happen. Please spread the word, use the timers and the app and hopefully, we can grow this further together. 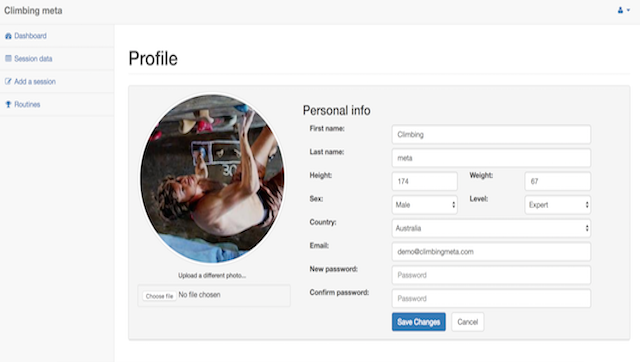 You can access the climbing tracker by selecting login/register in the menu on our site. 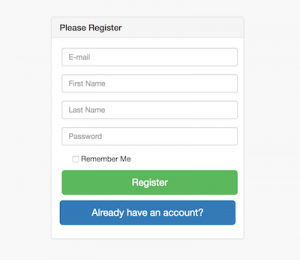 From here, either create a new account or log in using your existing details. The home page is the dashboard, which will show you your last 3 months worth of training data in a series of graphs. You can quickly change the data range from the range picker to see a pre-defined, or custom period. To access all the timers we have developed so far, select the routines tab in the menu on the left. These are broken down into Fingerboard, Campus board, Bouldering and Conditioning (Supp) exercises via the tabs on the page. The boxes contain the routine details, along with a link to the related blog post. Clicking on the ‘go get it‘ button will open the timer the web version of Seconds Pro. To download and save this, you should be using your phone with the Seconds Pro app installed. Once you have completed a routine, return to the climbing tracker page and select ‘add a session‘ to choose from each of the 4 category areas. Select the relevant one and begin entering your training data using the drop downs and fields. We recommend adding a comment for each session and rate it (good, bad, average), that way you can search for what worked and what didn’t at a later stage. If you prefer a paper option while you are training, you can add as many sets as you like to a new session and then print the blank form (using the print button at the top right of this page) for later use. Once you save your data, you will be redirected to the Session data table which can also be selected from the side menu. Here you can filter by column, search for keywords from your session comments and review or delete previous sessions via their links. At the bottom of the table, you can choose to download a CSV file so you have complete access to all your data and manipulate it further in a spreadsheet if you want to. You can add personal details by clicking on the profile icon at the top right of the page. These aren’t being used just yet, but we do have plans for this in the climbing tracker, so it is worth adding when you get a chance. Finally, you can also log out of the tracker from the profile icon. While it is great to see development, it’s important to remember that it takes time to improve. 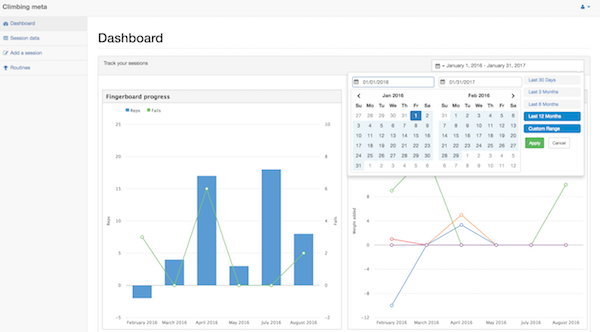 For this reason the dashboard plots data on the graphs monthly and show your combined training results for each area of training (Fingerboard, Campus board, Bouldering and Conditioning). As with most training programs, you should start to see trends and improvements after about 12 weeks, so hang in there. Entering the data can take a bit of getting used to as well. There are a few shortcuts you can take, like combining sets for example, but we’ll cover that in an upcoming article. If you have been recording your training on paper prior to now, then you can absolutely input that using the forms to get some immediate graphical feedback on your progress. As always we really want to hear from you to see what is working and what could work better, so leave a comment and tell us what you think of the climbing tracker. Remember to tag us @climbing_meta or #climbingmeta on social to show us how you are progressing!